A Danish Elvis Presley museum has been forced to rebrand after a legal challenge over its use of the name of the singer’s Graceland home. 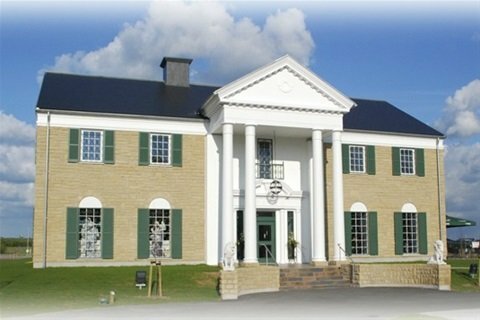 Graceland Randers, which opened in 2011 in the town of Randers, will now be known as the Memphis Mansion. The building is a replica of Elvis Presley’s Memphis home, but is twice the size to house a shop and restaurant. Henrik Knudsen, who runs the Danish attraction, said Elvis Presley Enterprises Inc demanded a name change. He said the company also sought 1.5 million kroner in compensation for the infringement of the Graceland name. Henrik Knudsen opened Graceland Randers in 2011 and put almost 6,000 Elvis items, from guitars and letters to clothes, on display. In a statement, he said: “Pending the case, we have chosen to change the name… namely to Memphis Mansion! Reports that the museum would have to close because of the lawsuit were incorrect, Henrik Knudsen added. More than 130,000 people visited the museum in 2015.